Your doctor may review your medical and family history, discuss your signs and symptoms, and conduct a physical examination. Your doctor may order several tests to diagnose hypertrophic cardiomyopathy (HCM). A doctor examines a patient at Mayo Clinic. Echocardiogram. Your doctor is likely to recommend an imaging test called an echocardiogram to diagnose hypertrophic cardiomyopathy. This test allows your doctor to see whether your heart muscle is abnormally thick, your blood flow is obstructed and your heart valves are moving normally. In a transthoracic echocardiogram, a device (transducer) is pressed firmly against your skin. The transducer aims an ultrasound beam through your chest to your heart, producing moving images of the working of the heart. Doctors may sometimes conduct another type of echocardiogram called a transesophageal echocardiogram. In this test, a flexible tube containing a transducer is guided down your throat and into the tube connecting your mouth and stomach (esophagus). From there, the transducer can obtain more-detailed images of your heart. This test may be recommended if it's difficult to get a clear picture of your heart with a standard echocardiogram or if the doctor wants to further examine your mitral valve. This test is done in very few people with hypertrophic cardiomyopathy. Electrocardiogram (ECG). Wires (electrodes) attached to adhesive pads on your skin measure electrical impulses from your heart. An ECG can detect enlarged chambers of your heart and abnormal heart rhythms. Treadmill stress test. Your heart rhythm, blood pressure and breathing are monitored while you walk on a treadmill. Your doctor may recommend a treadmill stress test to evaluate symptoms, determine your exercise capacity and determine if exercise provokes abnormal heart rhythms. Treadmill stress tests are sometimes performed with echocardiography if you have symptoms of HCM, but a resting echocardiogram doesn't show obstructed blood flow. Treadmill stress tests are commonly used in people with hypertrophic cardiomyopathy. Holter monitor. You may wear a portable ECG that records your heart's activity continuously over one to two days. This test is often done in people with hypertrophic cardiomyopathy. Cardiac MRI. A cardiac MRI uses magnetic fields and radio waves to create images of your heart. Cardiac MRI is often used in addition to echocardiograms to evaluate people with hypertrophic cardiomyopathy. Cardiac catheterization. In this procedure, a catheter is inserted into a blood vessel, usually in your neck or groin area. The catheter is then carefully threaded to your heart chambers under guidance of an X-ray machine. In addition to measuring pressures in your heart, cardiac catheterization is used to obtain X-ray images (angiograms) of your heart and blood vessels. A dye is injected through the catheter to help visualize your heart and blood vessels. This test is rarely used to diagnose hypertrophic cardiomyopathy. Genetic testing. Genetic tests may not provide a definitive answer because the genetic causes of hypertrophic cardiomyopathy aren't fully understood. Only about 50 percent of families with HCM have a currently detectable mutation, and some insurance companies may not cover genetic testing. However, if an abnormal gene is detected in your family, then other family members can learn if they are at risk of hypertrophic cardiomyopathy through genetic testing. Consultation with a genetic counselor is recommended to help you determine whether genetic testing is a good option for you. Echocardiogram. If genetic testing isn't done, or if the results aren't helpful, then your doctor may recommend echocardiograms on a regular basis if you have a family member with hypertrophic cardiomyopathy. Adolescents and competitive athletes should be screened once a year. Adults who don't compete in athletics should be screened every five years. A septal myectomy is an open-heart procedure in which the surgeon removes part of the thickened, overgrown septum between the ventricles. 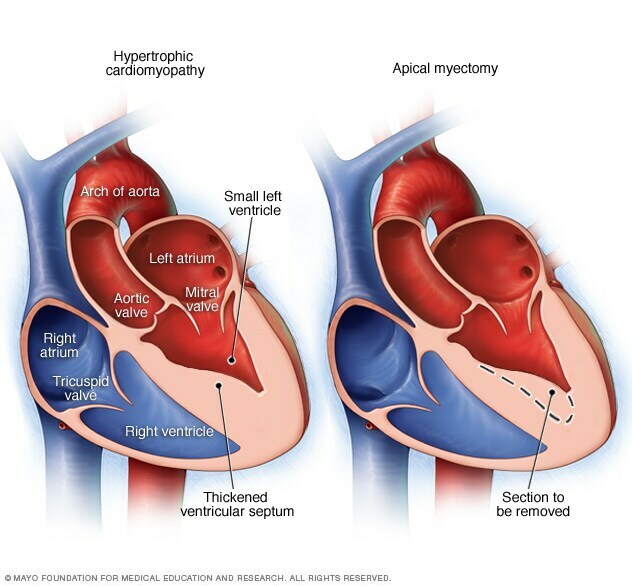 Surgeons may conduct a myectomy from near the tip of the heart, called an apical myectomy, to remove overgrown muscle located along the bottom and side of the lower left heart chamber (left ventricle). The goal of hypertrophic cardiomyopathy treatment is to relieve symptoms and prevent sudden cardiac death in people at high risk. Specific treatment varies depending on the severity of your symptoms. Your doctor will discuss with you the most appropriate treatment for your condition. Medications. You may be given medications to relax the heart muscle and to slow the heart rate so that the heart can pump more efficiently. Your doctor may recommend beta blockers such as metoprolol (Lopressor, Toprol), propranolol (Inderal, Innopran) or atenolol (Tenormin), calcium channel blockers such as verapamil (Verelan, Calan, Covera) or diltiazem (Cardizem, Tiazac, Dilacor), or medications to control your heart rhythm such as amiodarone (Pacerone) or disopyramide (Norpace). If you have atrial fibrillation, your doctor may prescribe blood thinners such as warfarin (Coumadin, Jantoven), dabigatran (Pradaxa), rivaroxaban (Xarelto) or apixaban (Eliquis) to reduce your risk of blood clots. Septal myectomy. A septal myectomy is an open-heart procedure in which the surgeon removes part of the thickened, overgrown septum between the ventricles. Removing part of this overgrown muscle improves blood flow and reduces mitral regurgitation. Surgeons may conduct this procedure using different approaches, depending on the location of the thickened heart muscle. In one type of septal myectomy called apical myectomy, surgeons remove thickened heart muscle from near the tip of the heart. Surgeons may sometimes perform mitral valve repair at the same time as a myectomy. A septal myectomy may be recommended if medications don't relieve your symptoms. Most people who have a myectomy have no further symptoms. 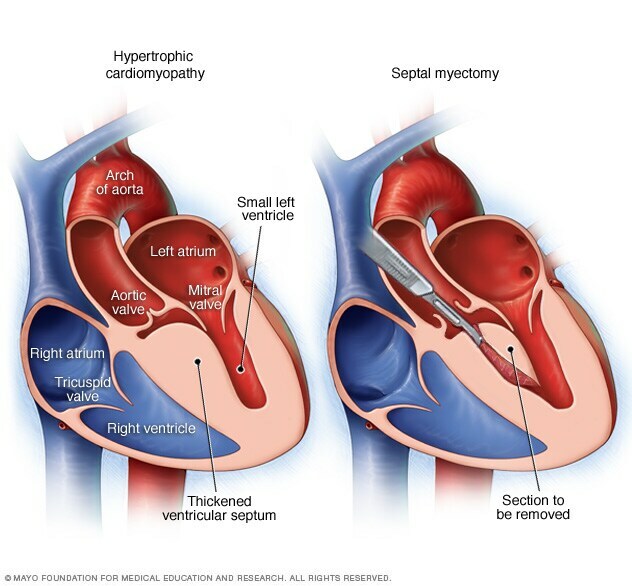 Septal myectomy is available only in medical centers that specialize in the treatment of hypertrophic cardiomyopathy. Septal ablation. In septal ablation, a small portion of the thickened heart muscle is destroyed by injecting alcohol through a long, thin tube (catheter) into the artery supplying blood to that area. This procedure may improve your symptoms. Possible complications with this procedure include heart block — a disruption of the heart's electrical system — which requires implantation of a pacemaker. Implantable cardioverter-defibrillator (ICD). Doctors may recommend an ICD if you have life-threatening heart rhythm disorders (arrhythmias) such as ventricular tachycardia or ventricular fibrillation. An ICD is a small device that continuously monitors your heartbeat. It's implanted in your chest like a pacemaker. If a life-threatening arrhythmia occurs, the ICD delivers precisely calibrated electrical shocks to restore a normal heart rhythm. Your doctor may recommend an ICD if you have hypertrophic cardiomyopathy and you're at high risk of sudden cardiac death because of abnormal heart rhythms. Getting physical activity. Competitive sports are generally not recommended for people with hypertrophic cardiomyopathy. Many people with hypertrophic cardiomyopathy may be able to participate in low- to moderate-intensity exercise as part of a healthy lifestyle. Ask your doctor for guidance. Eating a healthy diet. A healthy diet is an important part of maintaining your heart health. Maintaining a healthy weight. Maintaining a healthy weight will prevent excessive stress on your heart and reduce health risks associated with surgery or other procedures. Reducing alcohol use. If you have symptoms or a history of rhythms provoked by alcohol, ask your doctor for guidance about safe levels of alcohol use. Drinking too much alcohol can trigger irregular heart rhythms and can lead to increased blockage of blood flow in your heart. Taking your medications. Make sure to take your medications as prescribed. Having regular medical appointments. Your doctor may recommend regular follow-up appointments to evaluate your condition. Let your doctor know if you have any new or worse symptoms. Women who have hypertrophic cardiomyopathy can generally have normal pregnancies. However, if you have symptoms and complications of hypertrophic cardiomyopathy, your doctor may recommend that you see a doctor experienced in caring for women with high-risk conditions during your pregnancy. Being diagnosed with hypertrophic cardiomyopathy can cause a range of difficult emotions. Like many people with this condition, you may experience feelings of grief, fear and anger. These responses are appropriate to the lifestyle changes that come with your diagnosis. Reduce your stress. Find ways to reduce your stress. Get support. Get support from your friends and family. Follow lifestyle changes your doctor recommends. Making healthy lifestyle changes, such as eating a healthy diet and maintaining a healthy weight, can help you cope with living with your condition. You may be referred to a doctor trained in diagnosing and treating heart conditions (cardiologist). Here's some information to help you prepare for your appointment. Find out if you need to follow any pre-appointment restrictions, such as changing your activity level or your diet. Write down your symptoms and how long you've had them. What risks does my heart condition create? Should my children or other close relatives be screened for this condition, and should I meet with a genetic counselor? How will other conditions that I have or medications I take affect my heart problem? Before your appointment, ask your family members if any relatives have been diagnosed with hypertrophic cardiomyopathy or have experienced unexplained, sudden death. It will help your doctor to know as many details as possible about your family medical history. If exercise makes your symptoms worse, avoid strenuous exercise until you have seen your doctor and received specific exercise recommendations. Hypertrophic cardiomyopathy. American Heart Association. http://www.heart.org/HEARTORG/Conditions/More/Cardiomyopathy/Hypertrophic-Cardiomyopathy_UCM_444317_Article.jsp#.WbMHH9jrvIU. Accessed Aug. 29, 2017. What is cardiomyopathy? National Heart, Lung, and Blood Institute. https://www.nhlbi.nih.gov/health/health-topics/topics/cm. Accessed Aug. 29, 2017. Bonow RO, et al., eds. Hypertrophic cardiomyopathy. In: Braunwald's Heart Disease: A Textbook of Cardiovascular Medicine. 10th ed. Philadelphia, Pa.: Saunders Elsevier; 2015. https://www.clinicalkey.com. Accessed Aug. 29, 2017. Maron MS. Hypertrophic cardiomyopathy: Clinical manifestations, diagnosis, and evaluation. https://www.uptodate.com/contents/search. Accessed Aug. 29, 2017. Maron MS. Hypertrophic cardiomyopathy: Prevalence, pathophysiology, and management of concurrent atrial arrhythmias. https://www.uptodate.com/contents/search. Accessed Aug. 29, 2017. Maron MS. Hypertrophic cardiomyopathy: Assessment and management of ventricular arrhythmias and sudden cardiac death risk. https://www.uptodate.com/contents/search. Accessed Aug. 29, 2017. Maron MS. Hypertrophic cardiomyopathy: Gene mutations and clinical genetic testing. https://www.uptodate.com/contents/search. Accessed Aug. 29, 2017. Maron MS. Hypertrophic cardiomyopathy: Medical therapy. https://www.uptodate.com/contents/search. Accessed Aug. 29, 2017. Maron MS. Hypertrophic cardiomyopathy: Nonpharmacologic treatment of left ventricular outflow tract obstruction. https://www.uptodate.com/contents/search. Accessed Aug. 29, 2017. Prevention and treatment of cardiomyopathy. American Heart Association. http://www.heart.org/HEARTORG/Conditions/More/Cardiomyopathy/Prevention-and-Treatment-of-Cardiomyopathy_UCM_444176_Article.jsp#.WbbYzdjrvcs. Accessed Sept. 11, 2017. Maron BJ, et al. Hypertrophic cardiomyopathy: Present and future, with translation into contemporary cardiovascular medicine. Journal of the American College of Cardiology. 2014;64:83. Said SM, et al. Surgical treatment of hypertrophic cardiomyopathy. Seminars in Thoracic and Cardiovascular Surgery. 2013;25:300. AskMayoExpert. Hypertrophic cardiomyopathy (adult). Rochester, Minn.: Mayo Foundation for Medical Education and Research; 2016. Dearani JA, et al. Surgery insight: Septal myectomy for obstructive hypertrophic cardiomyopathy — The Mayo Clinic experience. Nature Clinical Practice Cardiovascular Medicine. 2007;4:503. Kirklin JW, et al. Surgical relief of diffuse subvalvular aortic stenosis. Circulation. 1961;24:739. Riggin EA. Allscripts EPSi. Mayo Clinic, Rochester, Minn. Aug. 30, 2017. Daniels BK. Echo Information Management System. Mayo Clinic, Rochester, Minn. Sept. 13, 2017.